In September 1848 the pro-‘vegan’ journal previously known as The Truth Tester was renamed as The Vegetarian Advocate. The editor and publisher, William Horsell in London, was also the first Secretary of the one-year-old Vegetarian Society, but this was a privately published journal which reflected some uneasy compromises within the new society. In 1849 the society’s President started publishing The Vegetarian Messenger from Manchester, and for the next year the two journals were effectively in competition. The Advocate ceased in August 1850, and Mr. Horsell stepped down as Secretary. The compromise was the usual one – the idea for the Vegetarian Society had come from the ‘vegans’ at Alcott House and Mr. Horsell’s Hydropathic Hospital, both near London; but the only way it could survive was with the considerable support of the strongly ‘ovo-lacto’ Bible Christian Church in Salford, near Manchester. William Horsell accepted the compromise on becoming secretary, and the first issue of the Advocate dutifully reported the banquet at the first AGM – including full details of the omelets and cheesecakes. But he couldn’t resist slipping in the alternatives. We have no record of the response from the President, but nothing like this appeared again in the Advocate for almost a year. However, when the Messenger started appearing from Manchester, Mr. Horsell seems to have decided to more actively promote his own views, and his other publications, in his own journal. September 1849 Advocate, p.10: review of ‘Kitchen Philosophy for Vegetarians’ published by W. Horsell, London. Quoting the book: “. . . butter and eggs are excluded . . .” This appears to be first known ‘vegan’ cookbook. The ‘Domestic Assistant’ was edited by Mrs. Elizabeth Horsell, who was equally active in the movement in her own right. But they made a small concession to some of their guests: “This was followed by barley pudding made with milk.” (the italics were his). 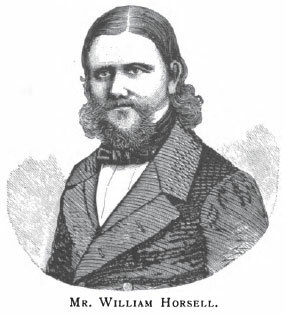 William Horsell had a background in the medical industry, and was now a publisher, all in the London area. It is tempting to wonder how much contact he had with the publishers of this particular London medical journal. They certainly expressed his own views very clearly . . . 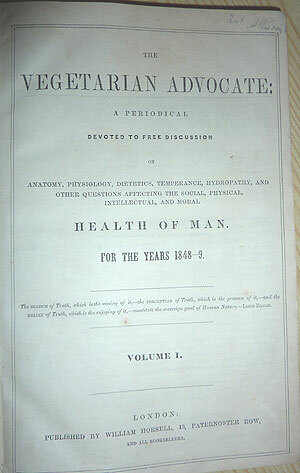 The next issue of The Vegetarian Advocate, August 1850, was a mere four pages, and was the last available to us. The editorial said it would change to fortnightly, and appealed for more advertisers. There is a record of some ‘supplements’ over the next few months, but we do not have copies of them. But Horsell went out with a flourish, printing a rather long and convoluted article by the American, Sylvester Graham, entitled ‘Butter and Cheese’. Not surprisingly arguing against the use of these products. The last issue also included a brief report from the Vegetarian Society for 1849-50, signed by the officers including William Horsell, secretary, still running the Society from his office in London up to July 1850. It appears that he was no longer secretary after that, and the Society’s office was moved to the Manchester area, where it has remained ever since.